I’ve decided this series on alternative therapies will first tackle the mistakes I made myself as a parent. The last blog (Part 1) was on vision therapy as a cure for dyslexia. Today, in Part 2, I’ll address Dr. Daniel Amen’s Brain Clinics and how they purport to diagnose and cure ADHD. Dr. Amen is larger than life. A media star, best-selling author of 30 books (5 New York Times bestsellers), producer of a t.v. show aired on PBS (or rather, infomercial) about his theories, paid motivational speaker, and master salesman promoting proprietary nutritional supplements. He has 8 clinics in California, New York, Washington, D.C., Chicago, Atlanta, and Washington State. They claim to treat pretty much anything, from ADHD, addiction, anxiety and depression, autism, bipolar disorder, concussions, Lyme disease, marital conflict, dementia, and sleep disorders to weight loss. That claim alone should be enough to make anyone skeptical. Claiming to be an expert at everything is usually overreaching. But let me zero in on how they “treat” ADHD. I read Dr. Amen’s book: Healing ADD: The Breakthrough Program That Allows You to See and Heal the 6 Types of ADD when it came out in 2002. It sounded convincingly scientific. Neuroimaging was on the uptick and being heralded as a huge scientific breakthrough. Amen claimed he could cure ADHD by looking inside the brain with a single-photon emission computed tomography (SPECT) scan using gamma rays and with injected radioactive dye and tailoring treatment to 7 different types of ADD: Classic, Inattentive, Overfocused, Temporal Lobe, Limbic, Ring of Fire, and Anxious. As my 2e son wasn’t responding to anything else we tried, the idea that he might have a specific subtype of ADHD that required a targeted treatment was appealing. So we paid a substantial fee and drove to an appointment at Dr. Amen’s first clinic in Northern California – somewhere in the Central Valley between San Francisco and Sacramento. We went through the intake process and were scheduled for SPECT scans. But something didn’t feel quite right, and I didn’t follow through. My response was instinctual at the time. But since then I’ve earned a PhD and reviewed the literature and scientific consensus from a more informed perspective. First, there is no research evidence (other than what comes out of Amen’s presumably biased clinics) to support the idea that there are seven different subtypes of ADHD. Real science – the kind backed by double blind studies, NIH supported grants, and published in reputable peer reviewed journals – has identified two types (Primarily Inattentive and Primarily Hyperactive/Impulsive). We’re kind of working on a possible third type tentatively called Sluggish Cognitive Tempo. There certainly is no such thing as “limbic” or “ring of fire” ADHD. Second, to do a SPECT scan, the child must be injected with an IV carrying radioactive material directly into his or her bloodstream. Its radiation-emitting particles are carried to every part of their growing body. 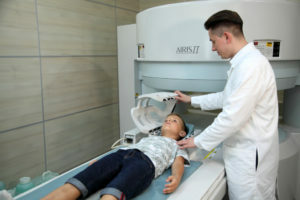 There is an increase in the possibility of cancer being caused as a result of this kind of radiation exposure, particularly for children, as their growth means more cells are dividing, providing a greater risk of radiation disrupting cell development. This is why they ask you if you’re pregnant before giving you a mammogram. The risk may be small, but it’s there. None of the nation’s most prestigious medical organizations — including the American Psychological Association, the National Institute of Mental Health, the American College of Radiology, the Society of Nuclear Medicine and Molecular Imaging, and the National Alliance on Mental Illness — validate his claims. Literally no major research institution takes his SPECT work seriously. Dr. Amen thinks he’s a “maverick” onto something that no one else in the field understands. I guess I might respect that (I do like mavericks) if he weren’t a self-promoter making a ton of money by preying on the fears and hopes of desperate families using invasive, potentially dangerous, and ineffective technology. Don't be fooled by his brand of pseudoscience.